Several reports indicate the far right, including fascists and neo-fascists are gaining ground in several EU member states. The far right perceived stand is on the question of EU membership. In Britain one anti-EU Tory MEP has turned himself into an apologist for fascists by accusing the left of misunderstanding the origins of fascism. He even says fascism and Nazism are and were based on socialism. The National Socialists (Nazis) were neither national nor socialist. Initially in the 1930's it was believed the Nazis were going to solve the unemployment problems within Germany. History tells us that they were for the expansion of imperialist Germany. They had the support of leading capitalists including Krupps and Ford who maintained and promoted Hitler and his fascist party. The larger transnational corporations today are the biggest supporters and promoters of the European Union. 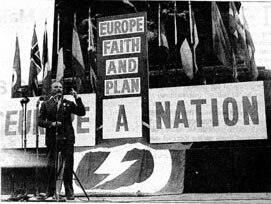 In Britain it was significant that Oswald Moseley's British Union of Fascists was the first political party in 1949 to call for a European Union. This union was to include parts of North Africa in "Europe". Again this was not a national policy but an imperialist pro-capitalist one supporting the end of national independence and right to self-determination. The latter along with democracy are the important and necessary pre-requisites for socialism. Once again the role today of fascists is one where they are held in reserve and if necessary promoted to take part in dividing the working class and peoples of Britain to ensure capitalism persists. Devices used would include playing either or both the 'race card' and 'red card' scares and is currently wrapped around the question of immigration. As this paper has explained many times the European Union and its institutions are the antithesis of democracy, national independence and right to self-determination. This includes the right to have a socialist economy or any other economic system. In other words the EU is top-hatted fascism without funny salutes and jackboots. Capitalism is set in reinforced concrete in the European Constitution. What has to be remembered and taken into consideration is that the majority of people in these islands are working class, and the organisations which represent them form the labour and trade union movement. Without the support of that movement there will be no getting Britain out of the EU. Poll after poll clearly indicates the overwhelming majority of people in Britain want an end to EU membership. The longer Britain stays in the EU the worse conditions will become. Austerity policies which emanate from Brussels are yet another taster of the immediate and short term future. These ConDem policies are permanent and are to be added to with further cuts in everything public. Cameron's talk of incomes rising faster than inflation by one tenth of one percent indicates a way out of austerity should fool nobody. Britain has been all but de-industrialised and currently suffers mass unemployment, especially amongst young people. The simple ability to create wealth and trade across the world is fast disappearing. The financial sector, City of London, banks and transnational corporations are represented by the millionaires' cabinet who rule the roost. They are in a hurry to consolidate their reactionary hold on everything and do not want Britain to leave the EU to regain the right to self determination and an to end capitalism. Cameron talk of amending EU treaties is an impossibility. The left in particular and the labour and trade union movement must wake up to the dangers of the far right taking the lead and return to an anti-EU position and take the lead to withdraw Britain from the EU then the right and far right will do so with dreadful and obvious consequences.